“Kulinda” – After a Navy reservist is killed while protecting a city councilman, Sam is sent undercover in a private security firm with links to several criminal organizations. Also, Callen and Anna (Bar Paly) discuss the next steps in their relationship, on NCIS: LOS ANGELES, Sunday, Jan. 8 (8:00-9:00 PM, ET/PT) on the CBS Television Network. “Tidings We Bring” – Sam partners with Anna (Bar Paly) and Callen goes with Deeks as the team investigates the disappearance of a Navy Lieutenant Commander who is working with the NSA on foreign cyber threats. Also, the team celebrates the holidays together, on NCIS: LOS ANGELES, Sunday, Dec. 18 (8:30-9:30 PM, ET/8:00-9:00 PM, PT) on the CBS Television Network. “Sirens” – After an unknown female assailant kills two men disguised as Sherriff’s deputies in front of Callen’s home, the NCIS team gets a new lead in the ongoing mole investigation. Also, Nell visits a prison to interview an inmate withholding information on the department’s leak, on NCIS: LOS ANGELES, Sunday, Nov. 27 (8:30-9:30 PM, ET/8:00-9:00 PM, PT), on the CBS Television Network. 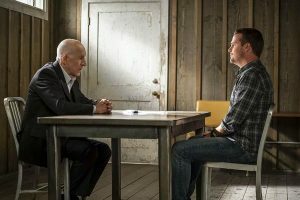 “Glasnost” – After Callen’s father, Garrison (Daniel J. Travanti) is found in an NCIS patient’s hospital room during a radiation poisoning case, Callen must take him to the boatshed for interrogation. Also, the team discusses their Thanksgiving plans, on NCIS: LOS ANGELES, Sunday, Nov. 20 (8:30-9:30 PM, ET/8:00-9:00 PM, PT), on the CBS Television Network. “Parallel Resistors” – After a graduate student developing an electromagnetic weapon for the Navy is attacked, the NCIS team discovers a connection to international warfare. Also, Kensi continues grueling physical therapy for her spinal injury, on NCIS: LOS ANGELES, Sunday, Nov. 13 (8:00-9:00 PM, ET/PT), on the CBS Television Network.